Teamwork Dressage is proud to be sponsored by Finish Line. We exclusively use Finish Line for our own and our clients horses. 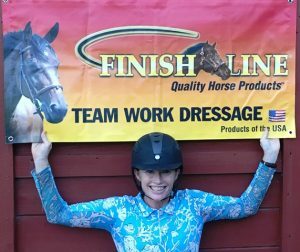 We thank Finish Line for their endorsement of Teamwork Dressage and our horses are the happy, lucky beneficiaries! Our Finish Line favorite is Total Control, which we feed am & pm. This product ensures your horse receives what is necessary for top level performance – joint care, electrolytes, amino acids, digestive aids, coat omegas, hoof supplements and more! In addition to Total Control during the summer months we add Apple-A-Day electrolytes and always when we show we use Finish Lines convenient oral electrolyte tubes. Also when we compete we supplement with either Finish Line, liquid U7 or powder U-7 which eases the stress of travel and supports good gastrointestinal health. It is common knowledge that good health and a robust immune system are the outcome of good gastrointestinal health for horses and humans! We do have a couple of horses in our barn who struggle with good respiration, particularly in the summer months here in FL, where we experience extreme humidity and Finish Lines Air Power provides excellent relief. Teamwork Dressage’s final recommendation is Finish Lines Fura Free. It is a topical salve that we use on horses, dogs, cats and ‘people’ around the barn. It promotes healthy skin and contains ingredients that reliably treat minor cuts skin irritations, scrapes and burns. It can also be used as a ‘sweat’ for swelling and inflammation. Most importantly like all of Finish Lines products it works , it’s safe and it’s legal!